Logline: A man returns home to find his wife acting strangely, demanding divorce, and driving the husband to discover what is causing her bizarre behaviour. Cold Berlin. Mark (Sam Neill) is a spy returning from an assignment. He is debriefed and arrives home to find that all is not well on the domestic front. His wife, Anna (Isabelle Adjani), is no longer the woman he once knew. Infidelity is the culprit, and a distraught Sam searches out his wife’s lover. He finds Heinrich (Heinz Bennett), a sensual neo-hippie spouting intellectual diatribes. But Heinrich insists Anna has moved on from him to someone else. This is true, she has progressed (regressed?) to another tryst - but no ordinary lover, something otherworldly; a slimy squid-like creature that writhes with silent intent, inexplicably born from her anguish, which she now copulates with at regular intervals in a derelict apartment building. Anna is driven to protect and feed her hideous lover at all costs. Mark tries in vain to save the marriage, for their young son, Bob (Michael Hogben), if nothing else. But Anna is distant, impulsive, and volatile. In turn Mark becomes desperate, obsessed, reckless. He hires a private investigator, which only complicates matters, and becomes involved with Bob’s schoolteacher, Helen (Adjani also), who looks the spitting image of his wife, except for violet eyes, bangs, and temperament. Soon Mark will be confronted with Anna’s deadly secret, her tenebrous agenda, and it will be his worst nightmare, where sanity, reality, and inhumanity will collide. Director Andrzej Zulawski pitched Possession to Hollywood as “The story of a woman who fucks an octopus.” After watching the movie, with all its horror symbolism, relationship allegory, sexual ambiguity, identity confusion, and supernatural, science fiction mysticism, you’ll agree with Zulawski’s obtuse and ironic sense of humour as presented to the Tinseltown conservatives. Zulawski, who is Polish, made the movie as a French/West German co-production. The American financiers would never understand his abstract, artistic intent. In fact the US distributor ended up radically re-editing the original cut, excising between thirty and forty minutes, re-scoring it with another composer, and adding a solarising filter effect over some of the movie’s climactic scenes, in order to try and market it to a broader American horror audience. It was even re-released in the States under the grindhousey title The Night the Screaming Stops. 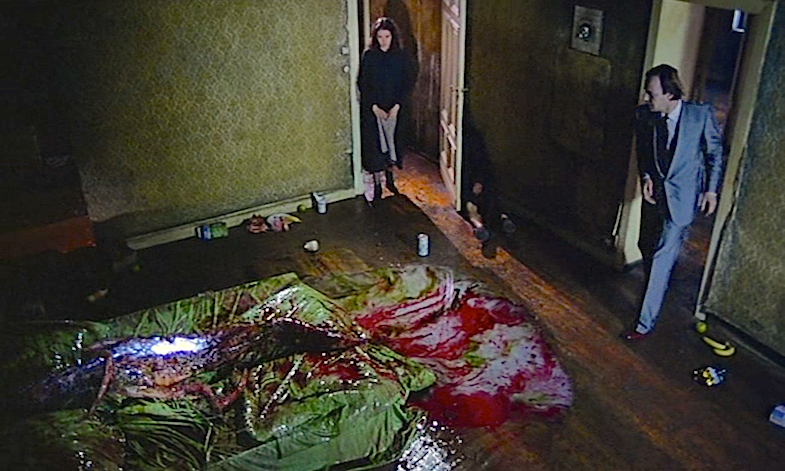 Primarily, Possession is about the breakdown of a marriage, about manipulation and self-control (or lack, thereof). But embroiled with this deconstruction of a once loving, now destructive relationship, are the insidious tendrils of betrayal and corruption; emotional, physiological, even theological. There’s the psychotherapeutic thread of releasing one’s inner Id, the black dog of male physical inadequacy, the wrath of female emotional instability, and the cruel trial of separation and abandonment. And then there’s the apocalyptic, ultimate nightmarish fear of children – that your parents are not really your parents. The pitch and tone of the movie veers from intense anxiety to outright hysteria, with little room to breathe in between. Adjani won the Palm D’Or for Best Actress, and it is an undeniably mercurial and memorable performance (Adjani admitted it took years for her to recover from the role). Sam Neill was not the most convincing actor as a younger man, but he throws himself into the role with wild gusto, and is supported (eclipsed) by Adjani’s dual high-calibre deliverance, and offset by the flamboyant histrionics of German actor Heinz Bennett. But it’s not just the unusual and original subject matter coupled with the ripe, overtly theatrical performances that gives Possession its je ne sais quoi, it’s the clean fluidity of the camerawork, the serene blue – melancholy – and green – jealousy – cinematography (an influence on Dario Argento’s Tenebre), the desolate West Berlin setting, and, of course, Carlo Rambaldi’s repulsive, ingenious animatronic creature effects, which stick in the mind long after the movie has finished. Indeed, utterly distinct, and utterly unique. Just as David Lynch has made enigmatic movies that seem impenetrable on first watch, but after multiple viewings became endlessly fascinating, serving up ideas and questions in different guises, with no straight, easy answers - or even answers at all, Zulawski’s Possession is a beast unto itself, a mutant depiction of domestic upheaval, creature horror, loss of faith, and frightening doppelgängers, all wrapped up in an escalating/spiraling frenzy of pursuit and cosmic revelation… with pink-socked espionage to boot. Flawed like a diamond cut from dark space, borne from bitterness, misery, lust and madness, it seethes and lurches, and makes huge demands of the viewer, but Possession rewards in ways only a truly philosophical, yet powerfully visceral, movie can.